The research aim is to document, understand and profile, century old buildings across Pakistan for archival purposes. The roots of historic buildings in South Asia lies in the early attempts of British engineers in the 18th century to design a standardized and permanent architecture based on indigenous domestic structures for the East India Company when the British were still traders in the sub-continent. In its later version, the archetypal bungalow in the 19th century consisted one and two-story structures, spacious buildings, internally divided, having a symmetrical layout with a veranda all around, situated in a large compound. This basic models was also adopted with modifications almost everywhere British imperial rule existed at that time to suit the local context and its environment. 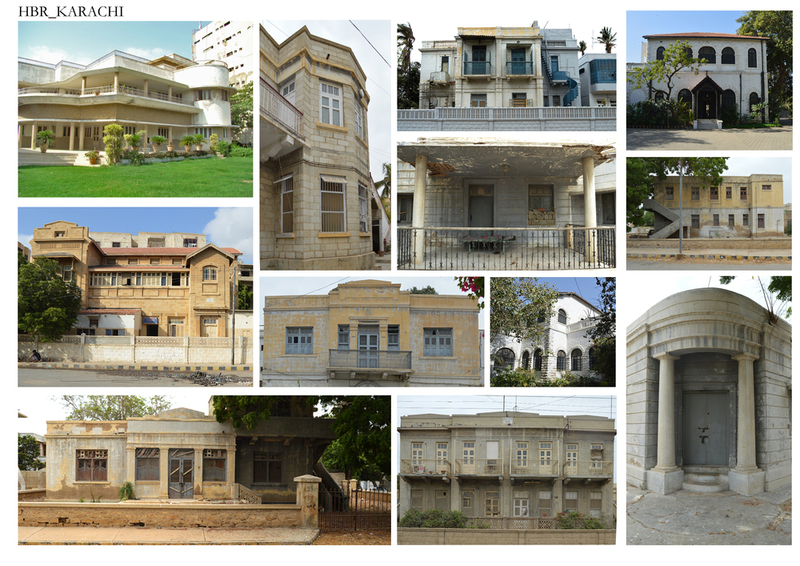 Documentation of Historic Bungalows of pre and post- partition styles, particularly Hindu, Sikh, Colonial and Art Deco. In Karachi bungalows located in the areas of Sohrab Kathrik Parsi Colony, Sirai Quarters, Old Town Quarters, Preedy Quarters, Garden Quarters, Rambagh Quarters, Bunder Quarters and Soldier Bazaar are being documented. The architectural typology consist of the bungalows material, structure, elements and spaces. Symmetrical floor plans and elevation pertaining to the Colonial architecture while Hindu Architecture is an open, symmetry driven structure with perfect geometric shapes and courtyard. Architectural elements consist of high ceilings, porticos, verandas, ventilators and columns. Key Architectural Features identify the style and era the bungalows belong to. The styles are broken down by the Period or Movement they are traditionally associated with. Architectural elements and features such as ventilators, windows, corridors, porticos, columns, jaali aid in recognizing the style and period of the Bungalow. These considerations will provide useful guidance when examining the significance of a building. The Sukkur Irrigation Colony is laid out on a grid plan which consisted of 52 bungalows and promenade out of which only 17 are left standing. The occupants of the bungalows are either government or privately owned. These 600-1000 square foot bungalows typology consists of semi-open corridors, porch, arched windows and arched corridors.